SUNSET CLIFFS, CA. Ah, the rites of Spring, the rites of passage. Jim Grant, local photographer best known for his amazing sunsets, sent us this pic of local kids doing the jump. Ah, to be young again. In my youth, just a few moons ago, I did this jump a number of times. I even swam through the yucky seaweed to the cave, walked in a few yards and found the hidden stairs to the old locked door that leads to the secret passageway. It was used during Prohibition for booze runners. They hadn’t heard yet of the ‘no alcohol’ ban in San Diego parks. Anybody else do this jump? Come on, admit it, Dave Cave. I love this jump! Good times have been had here. Jim Grant’s original that he sent was of higher quality but a HUGE file that wouldn’t fit. So I had to scale it back, and in the process lost the crispness that it had. that looks dangerous. quick, call the city! maybe thay can block it off with all the benches they removed. I remember it well, that nagging lump in my stomach, my balls entering my throat, the exhilaration, the just plain fun! Hiding from the lifeguards/police when they showed up thinking they could stop a ritual that has been going on for decades in OB. Both my sons spent many days jumping when the surf was flat. Who needs water-parks! 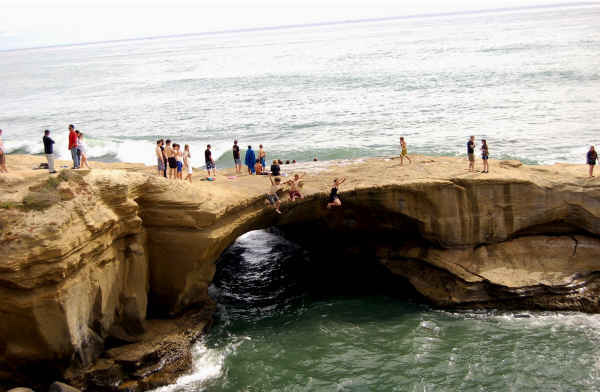 PSD – this favorite jumpin off spot is just north of Froude Street along Sunset Cliffs Blvd.